A strong breeze at Roganstown made for testing conditions today at the Irish Girls’ Open Stroke Play Championship. However, despite conditions, pace of play was the real winner with all groups finishing 10 minutes ahead of time on average. 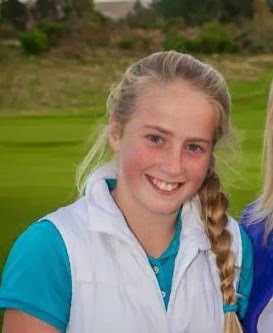 Having held the lead after round one, Kajsa Arwefjall slipped to a 3 over par 74 today and was forced to concede her lead to fellow Swede Louise Rydqvist. Rydqvist opened with a 1 under par 70 on Friday and matched that score again today. Despite two bogeys in her last three holes, birdies on the 5th, 8th, 12th and 14th were enough to secure the advantage heading into the concluding round. Rydqvist will have two shots to spare when she tees off alongside Ebonie Lewis (England) and Marie Bechtold (Germany) in the final group on Sunday. 152 K Lanigan (Hermitage) 77 75, O Bergner (Germany) 77 75, D Harry (Wales) 76 76, A Foster (Elm Park) 76 76, E Willis (Wales) 73 79, R Belsham (England) 72 80. 171 C Brennan (Belvoir Park) 84 87.